Think you know everything about Halo 3? Think again. I've got some new info and I'm prepared to share it with you. The only question is: are you prepared? If you want to be completely surprised on September 25th, then skip right past this article. If you're like the rest of us, then, well, sit back and enjoy! *NOTE* Even if you've read the EGM Halo 3 article, you still might find some things you didn't know. I'm talking exclusive info- and we have it! - Mauler: Ooo... sounds menacing! The Mauler is essentially a brute shotgun. The catch, it's dual-wieldable. Obviously, if you can hold two at once, it's not quite as strong as a regular shotgun. Oh, and it has s blade sticking off of it- what a surprise! 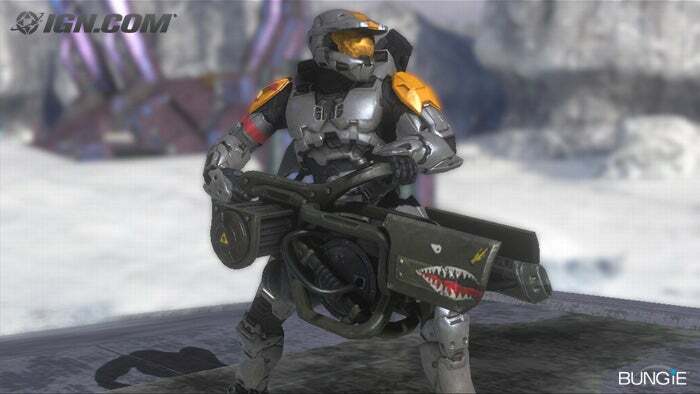 -Gravity Hammer: Remember that awesome hammer Tartarus carried in Halo 2? Yep, you can use that. It has a lunge attack similar to the energy sword, but also does area-effect damage. It's called a gravity hammer for a reason, you know. You can send a vehicle flying with a single hit, or send a grenade flying back to its sender due to the hammer's massive shockwave. -Flamethrower: It's in. Finally, the flamethrower is in! The flamethrower is a turret weapon, which means the camera will pull out to third-person mode when you use it. It shoots in three second bursts, with nine bursts total. The flame shoots out a massive 44 feet and will adhere to any surface. -Plasma Turret: Yep, you can detach these babies too! They also look slightly different. - That mysterious golden gun- It's seen in the new E3 trailer and even on one of the new EGM covers, but just what the hell is it? We'll have to wait and find out. - Firebomb: Before, you used to be able to hold four plasma grenades and four frag grenades. That's eight grenades. 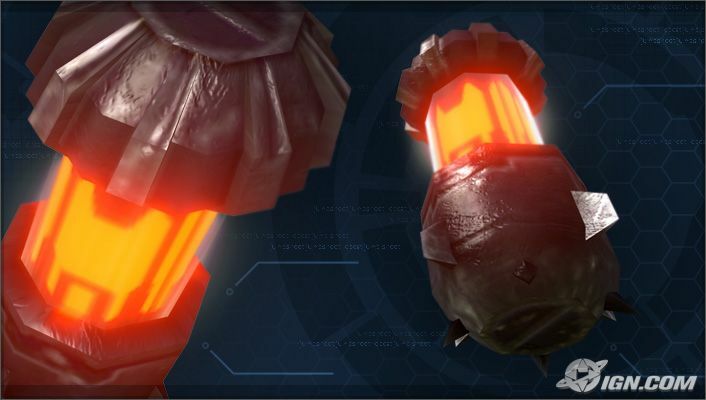 In Halo 3, because of the additi on of the spike grenade, you can hold two of each. Lets see... three grenades times two each... that's... wait a minute! That's two grenades short! That's where the Firebomb comes in. This new grenade will explode on impact and set ablaze anything in an 8 ft. radius for 4.5 seconds. It can also be used to create a wall of fire to cut off enemies. You may remember some Halo 2 concept art for the Brute a while back. You may also remember a mysterious grenade hanging off of the Brute's belt. That would be the new firebomb. - Chopper: You probably already know by now, but since it wasn't i n the Beta I'm including it here. The chopper is a GIANT hovering brute motorcycle. Its got a giant engine in the front with two side mounted mega brute shots. The down side? It doesn't offer much cover for the driver, but if you're hit with one it surely means instant death. - Hornet: Finally, the UNSC answer to the Banshee! It's a pretty sick looking plane/helecopter hybrid that has two mounted machine gun turrets. Two other players can hang off the side. This is useful for both troop transport and extra firepower. -Prowler: Described as a jet turbine engine on a sled, this new brute vehicle holds a driver, a man on the forward-mounted turret and two passengers on the side. Sounds to me like a much cooler and better looking version of the horrible Covenant Spectre. -Troop transport Hog: One of the warthog variants that didn't make it into Halo 2. You may have seen a picture of it along with a snow hog and a jungle hog. It looks almost unchanged from then and can hold an additional four (possibly six) passengers. Hey, if the transport hog and the ATV made it out of Halo 2, maybe we will see some more hog variants (like the rocket hog)! The gauss-cannon hog is also confirmed to return. -Elephant: This UNSC vehicle is large enough to fit a scorpion tank, four warthogs, and two mongooses. I'm not kidding. The elephant is a mobile base. It can house a dozen plus soldiers, has a mounted turret, houses the team's flag, is where your team respawns, and, oh yeah, did I mention it's indestructible? The downside is, as you'd expect, that the elephant is very, very, slow. -Radar Jammer: Drop this in the heat of battle to really confuse your foes! The radar jammer creates fake enemies on an opponent's radar and causes their shield to malfunction, simulating fake enemy attacks. -Personal Shield: Remember those stationary shields you could hide behind in the first Halo? Now you can drop them where ever you need them. It will block enemy attacks from one direction, and, unlike the bubble shield, you can fire through it to attack enemies. -Regenerator: It's the exact opposite of the Power Drainer. After this item is dropped, it creates a field that instantly recharges the shield of anyone who steps into it. -Flare: Very simple: drop it and it creates a bright light that blinds anyone close to it. -Invincibly: Just as the name implies, it will grant you temporary invincibility. It is used by Brute Chiefs in single player. It will rarely appear in multiplayer games. It is assumed this is a pickup item similar to the active camouflage or overshield rather than equipment. -Jenga: Create a big stack of explosive fusion cores followed by a giant crate. Then, start carefully dropping more fusion coils on top. If you do it wrong, the entire stack will explode- right in your face. - Grab the Mongoose: One guy zips around the stage on a mongoose while the other tries to pull the mongoose out from under him. -Magic Carpet Ride: Pick up a crate with a player on top of it and try to fly him around the level with out him falling off. -RTS Slayer: Each team has a monitor to create items or equipment for them as its needed in response to the actions of the other team. You can even save your levels and custom game types and share them through Halo 3's file share! Speaking of maps, there are plenty of new ones in Halo 3 besides the three you saw in the beta. Epitaph: An ancient forerunner temple in the middle of the desert complete with ancient shield doors! Last Resort: A slightly upgraded remake of Halo 2's Zanzibar. Guardian: This Lockout successor is set in a misty forest. Sandtrap: The largest Halo map ever created. Set in a massive desert landscape, the map is scattered with vehicles to help players get around. That means massive vehicular carnage! Oh, and this is also the stage where the massive Elephant makes an appearance! Oh, and one more little note: yes, Elites in multiplayer do have different armor types. I wish I had pictures of most of this stuff, but I don't and I can't find any scans of the EGM article. Instead, please enjoy some new shots from the Japanese magazine Famitsu here and here. Halo 3 will indeed have co-op for 4 players. Even better, Halo 3 will have co-op for 4 players online! Player one will control the chief, player two will control the arbiter, and players three and four will control two brand new elite characters.